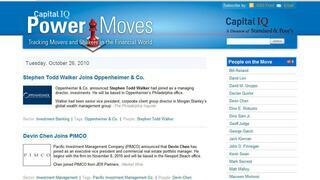 Capital IQ Powermoves was a short “mechanic” project working on a WordPress-driven blog for a financial industry news provider. The WordPress theme was redesigned to improve back end performance by streamlining the category and tag system and implementing a better cache system. The theme was also modified to include a search links for custom fields for the names of individuals relevant to each post. The original theme for Capital IQ Powermoves was done by another web developer.